Canada is at the far left of the chart with consumers getting less for their money than anyone else. While many countries offer unlimited mobile data at that price, the report says Canadian carriers offer a measly 2 GB. The smartphone data plans aren’t much better, with nearly all countries offering better deals and many shifting to unlimited data at that price. While it falls outside of the Rewheel study, a quick review of the major carriers reveals that some offers can’t be purchased in Canada at any price as no one offers unlimited mobile data. 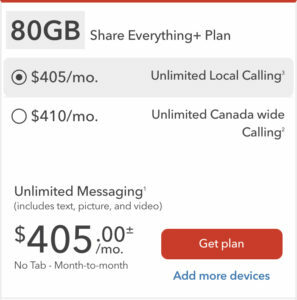 Rogers smartphone plans in Ontario max out at 80 GB of data at a cost of $405 per month or 263 euros (consumers in the UK can get 100 GB for 30 euros). 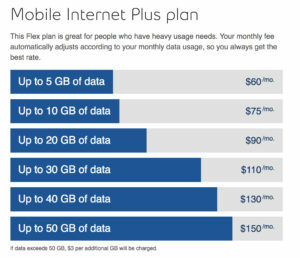 Meanwhile, Bell’s mobile broadband service tops out at 50 GB of data for $150. At $3 for each additional GB, it would cost $300 for 100 GB (France and New Zealand have plans for 30 euros for 100 GB) and $1500 for 500 GB (Israel has 500 GB for 30 euros). In addition to outrageously expensive wireless data plans, Canadians also face huge overage charges (more than a billion dollars per year generated in the wireless overage cash grab) and steadily increasing roaming charges. Yet when it came to introducing greater resale competition, the CRTC rejected new measures that it admitted could result in some improvement to affordability. Should I be considering a satellite-based service from a supplier in the EU? Their plans are also getting more expensive, contrary to the global trend. I have an 100GB for $150 mobile broadband plan from Bell that I got less than a year ago. I was unpleasantly surprised to see they now offer half as much for the same price. In doing a bit of research, I discovered that it would be considerably cheaper for me to have my mobile account in Buffalo with a U.S. telecom with unlimited calls to Canada than I am paying Rogers Communications, Bell Canada or TELUS. All I have to do is somehow find a Buffalo address, which I am now trying to find.